This module lets you display an interactive GUI relying on the "Display" AGS built-in function rather than a regular function. - it has the wams "flow" as the Display function (or Wait(1)): it blocks the game but still lets repeatedly_execute_always run once after each time it's called. 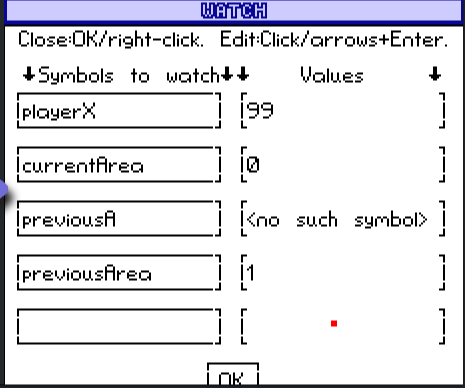 - you may use the keyboard left/right/up/down keys (to select the button or textbox), use "return" to validate your choice, or "escape" to close, etc. More generally, it's a basic toolbox that could become handy for anyone wishing to implement a GUI based on text, independently from the AGS context. As a demo I implemented a Yes/No popup but you can also implement easily a popup window that prompts the user to enter text into an interactive textbox (moving cursor, backslash, "del" key, etc. ).